eBook im Jahr 2017 beim Springer VS erschienen. Hardcover-Ausgabe erscheint 2018 im Springer VS. The book by Prof. Dr. Stefan Fröhlich and Prof. Dr. Howard Loewen examines a highly relevant empirical issue in International Rela- tions. 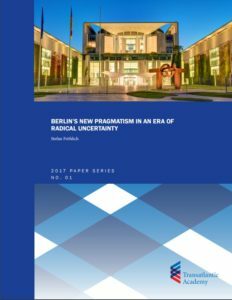 A group of renowned scholars analyzes the new dynamics of East Asian Security and its respective governance structure challenging the conventional wisdom that the US as the traditional offshore balancer in the region is still the most definitive element in determining the outcomes in the region. Since the US pivot and other actors’ responses to it the security landscape has changed in form, size and function. In order to analyze and explain these changes, the authors apply hypotheses derived from Inter- national Relations middle range theories (i.e. soft and hard balancing) to cases of bilateral and multilateral security governance in East Asia. The Changing East Asian Security Landscape. Challenges, Actors and Governance. Erschienen 2017 bei der Transatlantic Academy. As the Trump administration settles in, and attention turns to the September parliamentary elections in Germany, where is the U.S.-German relationship heading? The fellows of the Transatlantic Academy, Frédéric Bozo, Prof. Dr. Stefan Fröhlich, Wade Jacoby, Harold James, Michael Kimmage, Hans Kundani, Yascha Mounk, Ted Reinert, Mary Elise Sarotte, Stephen F. Szabo and Heidi Tworek have spent the past eight months focusing on this topic. 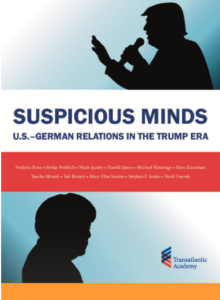 Their report Suspicious Minds: U.S.-German Relations in the Trump Era argues that the relationship, while close at the government level in recent years under Chancellor Angela Merkel and President Barack Obama, is challenged by underlying divisions on economic policies, security policies, and the role of German leadership in the European Union. The presidency of Donald Trump, who has questioned fundamental principles of U.S. foreign policy that have been shared by both parties and go back decades, may dramatically worsen U.S.-German relations. The fellows offer recommendations for U.S., German, and European policymakers going forward. Erschienen 2017 beim German Marshall Fund. 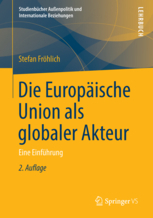 Das Lehrbuch „Die Europäische Union als globaler Akteur“ ist 2014 in 2., überarbeiteter Auflage erschienen. Dieses Studienbuch bietet einen Gesamtblick auf die europäische Außenpolitik und auf die globale Rolle der Europäischen Union. Neben der institutionellen Architektur und Praxis der GASP und ESVP werden die zentralen Dimensionen und Instrumente der europäischen Außenwirtschafts- und Außenbeziehungen sowie das Verhältnis der EU zu den wichtigen internationalen Organisationen, Ländern und Weltregionen behandelt. Anlass für die Neuauflage dieses Lehrbuchs ist die Änderung der Europäischen Verträge durch den Vertrag von Lissabon. The United States and Europe encounter many of the same foreign policy challenges, challenges that diversely impact the two regions and produce different—but often complementary—responses. In regard to Russia’s renewed assertiveness, for example, the issue for the United States is one of global competition, whereas Europe’s concern is local because Russia is a major supplier of oil and gas. Where the United States may pursue confrontation, Europe is more likely to operate with conciliation. This book develops a framework for future U.S.-Europe relations as the two world powers work toward meaningful and logical solutions to their shared foreign policy problems. The author identifies commonalities and differences in the two regions‘ economic aims, political habits, and cultural history. What Europe and the United States share means that their future relations should and will be more than occasional collaborations, even if they no longer pursue a common mission. 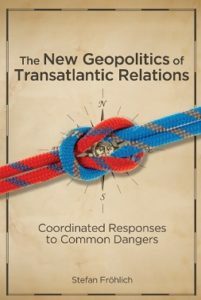 Ultimately, the book sets forth a new transatlantic agenda by discussing principal areas of concern. 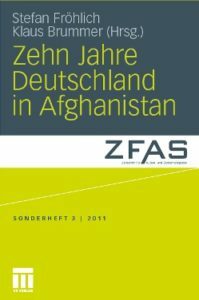 Zehn Jahre Deutschland in Afghanistan – Der Deutsche Einsatz in Afghanistan: Eine Bilanz. 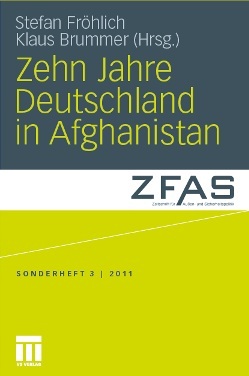 Dieses Sonderheft der „Zeitschrift für Außen- und Sicherheitspolitik“ (ZfAS) analysiert das militärische und zivile Engagement der Bundesrepublik Deutschland in Afghanistan seit 2001. Die 14 Beiträge verorten Deutschlands Afghanistanpolitik im Rahmen von internationalen Organisationen (NATO, EU, Vereinte Nationen), untersuchen die innenpolitische Rückkopplung der deutschen Politik in Parteien und Bevölkerung und beleuchten spezifische Handlungsstrategien (vernetzte Sicherheit) und Handlungsfelder (u. a. Drogenbekämpfung). Sie fragen außerdem nach dem Einfluss von Überzeugungen einzelner Entscheidungsträger auf die deutsche Afghanistanpolitik, diskutieren die Folgen des Einsatzes am Hindukusch für das deutsche „Zivilmachtsverständnis“ und erörtern die Konsequenzen des nunmehr zehnjährigen Engagements in Afghanistan für die transatlantischen Beziehungen. Insgesamt zeigen die Beiträge vielfache Unklarheiten in der deutschen Politik gegenüber Afghanistan auf, etwa: Was bedeutet das Konzept der „vernetzten Sicherheit“ in der Praxis? Befindet sich Deutschland in einem „Krieg“? Und wann muss bzw. darf der Abzug beginnen? 2011 erschienen beim VS Verlag Wiesbaden in der Reihe: Sonderheft der Zeitschrift für Außen- und Sicherheitspolitik.